But what if you’re miles away from a Thai restaurant and just want to recreate the experience at home? Well, that’s what I set out to do. I spent some time talking with Chef Peter, who came to the United States from Bangkok via California and now runs the kitchen at 1001 Thai in Easton, PA, my favorite local Thai place. The recipe below is how he makes pad Thai. Pad Thai is a popular rice noodle dish that is on the menu of nearly every Thai restaurant. It is indeed served in Thailand, usually with tofu. “This is like McDonald’s” for Thai people, says Peter, with a laugh. Which is to say it’s fast food; he says in Thailand it’s street food that cooks quickly in a very hot wok or pan. Pad Thai is often served with chopped peanuts, bean sprouts, scallions, and sometimes carrots, cilantro and/or a wedge of lime. The sauce is key and is comprised of sugar, fish sauce, rice vinegar, and tamarind. Pad Thai, more often than not, is served with tofu as its protein; shrimp is not uncommon either in Thailand. “Americans like their chicken, so we serve it that way here, too,” Peter says. In the recipe below I’m using shrimp, but you could really use any protein you prefer. Pad Thai is Fast Food. Literally. The only tricks, if there are any, have to do with timing. The actual dish itself takes less than 10 minutes to get to the table, which continued to surprise me, even as I was working on this recipe multiple times. All of a sudden, it’s ready! The key is to have your ingredients prepped and ready—and the table set for dinner. Pad Thai is also typically made one serving at a time—but the average home cook isn’t going to want to repeat this procedure multiple times for every guest at their table. This recipe serves four, and I highly recommend making it in two batches. The first time I made pad Thai following Peter’s recipe, that is what I did to serve myself and my two boys, and that seemed workable. You have proper sauce distribution. The noodles don’t get gummy. The flavors can properly integrate when you bring the ingredients together. No one wants to fight with a giant wad of noodles in a wok—or on their plate. Cooked this way, two servings at a time, it will taste more like the pad Thai you have in restaurants where everything is typically made to order. Each batch of the pad Thai comes together very fast, so you could either serve a little bit of the first round to those who are waiting, or you could just wait and serve it all together. Personally, I am always a proponent of serving hot food when it’s hot, and Asian restaurants will often bring you food when it’s ready, not necessarily to time it with everyone else’s orders. A large wok will make your life a lot easier when it comes to making pad Thai. It’s high on all sides, and you can load a lot of ingredients into it. 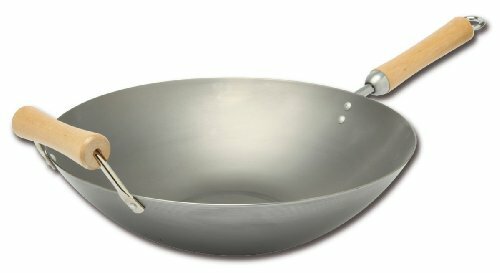 Woks are also typically made of thin but highly conductive materials, which ensure even cooking over very high heat. It’s also wise to have a sieve that can easily accommodate noodles as you cook them, and a pot that can easily accommodate your strainer. 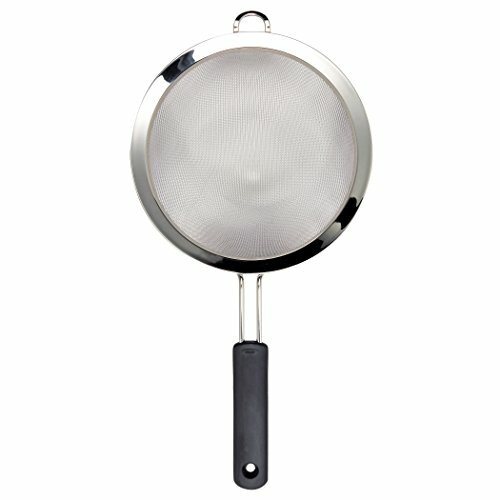 A standard 8-inch fine mesh strainer, like this one from OXO, should work just fine with a large stock pot. Pad Thai sauce is made typically with these four basic ingredients: tamarind, sugar, rice vinegar, and fish sauce. This makes a sauce that’s both sweet and sour, but also has some umami, earthy depth from the fish sauce. A good pad Thai sauce shouldn’t impart one strong flavor markedly over the other; it’s a balance. Tamarind is a fruit that’s commonly found in Thailand and is a key ingredient used to make the pad Thai sauce. It grows in long pods and is often sold as pulp that’s been compacted into blocks, or bricks. To use it, you soak a block of the pulp in warm water for an hour or so or up to overnight. Then, you squeeze the pulp to break it up and push it gently through a fine mesh sieve. What ends up on the other side in your bowl is a dark reddish puree that looks like apple butter but smells way more tangy. It is velvety, sweet, and sour. However, not everyone has access to this ingredient, plus it’s a little labor intensive for the home cook to prepare, so we developed this recipe using tamarind concentrate/tamarind paste, which is thick like molasses—and sticky like it, too. It’s also more widely available than the pulp, which you can easily buy online or in Asian grocers. You should also be able to easily find the rice vinegar and fish sauce in the Asian section of most supermarkets. Chef Peter cautions that tamarind will vary in taste from package to package or jar to jar. Sometimes it will be more sweet, sometimes more sour. This is why it’s very important to taste as you go when making the sauce—you may find the sauce is too sweet, and if so, add a little more acidity from rice vinegar, or some more fish sauce to give it some umami depth. Similarly, fish sauce varies from brand to brand. He let me sample two that he had on hand at the restaurant, and one was much more pungent than the other. Golden Boy (the less assertively fishy) is the brand he recommended. The more you make pad Thai and work with the sauce, the more you’ll be able to tell what your sauce needs, and how you like it to taste. You can buy pad Thai sauce in a bottle, sure. I’ve even got a small bottle of it in my fridge made by a local condiment company, and it’s pretty awesome in a pinch. However, like most things, it just tastes so much better when you make it yourself. Whatever sauce you don’t use, you can store in the refrigerator for up to six months in a lidded container. You’ll want to shake it well before using to mix up the ingredients again. What Rice Noodles to Buy? The rice noodles are key. You’re looking for wide rice noodles (about width of fettuccine), which usually come in nondescript looking plastic bags in the grocery store—they’re fairly easy to find, usually in the international aisle. Asian grocers will have them, too. Don’t bother looking at the directions on the package. They may or may not be in a language you can read (or reliable), and according to my Thai chef instructor, more often than not they don’t offer the best way to prep the noodles. Also, if you take the noodles out of the package and cook them straight away in boiling water, they’re more likely to end up overcooked and gummy once you put them in a hot pan with the other ingredients. So what do you do? You soak them in cold water, which softens them just enough to cook them into a hot wok or pan with the rest of the ingredients. The noodles take about two to three hours to soften, but you can also set them in cold water in a lidded container, stick them in the fridge, and pull them out the next night for dinner with no problem whatsoever. Trust me on this. I’ve learned it the hard way, and Chef’s tip about soaking them instead of cooking them first is a real game changer for pad Thai. All you need to do, once they’ve soaked, is quickly dip them in and out of a pot of boiling water to par-cook them (partially cook) before adding them to the pan with the rest of the ingredients. When it’s time to serve, you want the noodles to be covered in sauce, but the dish isn’t saucy. The bean sprouts, Chef Peter says, help keep the noodles from sticking together. Serve with wedges of lime and a sprinkle of chopped cilantro and/or red pepper flakes, if you like. Leftovers keep for three to four days covered, in the fridge. Peter swears by microwaving pad Thai to reheat it. I can attest to this. You don’t even have to add any water to the noodles. I do mine in 30-second increments so it doesn’t make the shrimp rubbery. COOK THIS RECIPE IN TWO BATCHES. I had the best results with this dish when I made it in two batches. I cooked half the eggs, half the shrimp, half the noodles, and so forth, and then repeated the process. It’s much easier to manage the ingredients in the wok this way, and it more closely mimics the way pad Thai is prepared, which is one dish at a time. 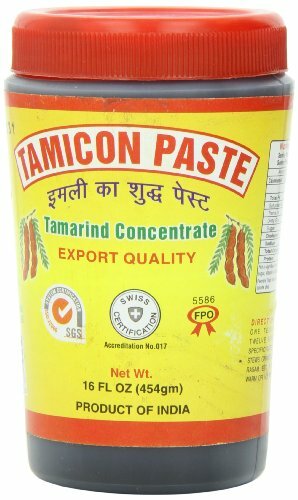 If you buy tamarind pulp instead of concentrate, put the entire block of it in a bowl covered with warm to hot water (enough to cover, maybe 3 to 4 cups) and let it soak for 30 minutes. Then, using your hands, break up the pulp to separate the large seeds and fibrous parts. Run the remainder of the pulp through a fine mesh sieve, into a bowl, scraping the underside of the sieve to remove any pulp that may have gotten stuck. You should have about 1/2 cup of pulp—it will be velvety and look like apple butter. You use the entire amount and it results in a slightly thicker sauce. 1 Soak the rice noodles: In a large container, preferably one with a lid, soak the noodles in cold water, enough to cover so that no noodle is poking out. Soak for at least 2 hours, or up to 24 hours. It can be refrigerated, or not—it doesn’t matter. 2 Make the sauce: In a shallow bowl, whisk together the fish sauce, vinegar, tamarind concentrate, and sugar until smooth. Taste. Adjust the sauce as needed. Add a pinch of paprika or cayenne powder for color. 3 Bring a large pot of water to boil. 4 Divide all of your ingredients into two batches. Arrange them near your stove. You’ll prepare each batch completely, one after the next. 5 Cook the eggs: Heat a wok or other large pan with high sides over high heat, which you will maintain throughout cooking the pad Thai. Add 2 to 3 tablespoons of oil. When the oil starts to shimmer a bit, it’s ready. Crack the eggs for this batch into the pan and, using the tip of a wooden spoon, gently loosen and break the yolk. You want to have enough oil in the pan so it looks as though the egg is floating, or suspended, in the oil. This gives you more surface area to cook the egg without it burning or turning it into scrambled eggs. Gently shake and flip the egg around in the pan. Break it up a bit with the spoon, but don’t scramble it by any means. This should take about a minute. 6 Cook the shrimp: Add 1 to 2 more tablespoons of oil to the pan if the pan seems too dry, and add the shrimp for this batch. Toss them gently in the pan and move them around with the wooden spoon to get some color on them, about a minute. Shake out the excess hot water and taste to make sure the noodles have softened but still have a little give to them. 8 Add the noodles to the pan: Transfer the noodles to the hot pan with the shrimp. Keep the noodles long; don’t chop them up in the pan (long noodles mean long life, Chef Peter says). Taste to make sure they have softened; the noodles don’t need to be completely cooked at this point because they will continue to cook in the wok. Toss them gently in the pan and stir them briefly to keep them from sticking together. When the noodles look shiny, it’s time for the sauce. 9 Add the sauce: Quickly whisk the sauce if the sugar seems to have settled, and add about 1/4 cup to the pan. Gently toss and flip the noodles in the pan. Again, stir them quickly to integrate the sauce; when you can’t see any more sauce in the pan, you'll know it's ready and that the noodles have absorbed the sauce. 10 Add the peanuts and bean sprouts: Add the peanuts and the sprouts, and toss all ingredients together quickly. Cook for 2 to 3 minutes until everything is heated through. The noodles will soften and look more translucent. 11 Taste and serve: Turn the heat off the pan and taste to make sure there is enough sauce to flavor the dish. Serve immediately in individual bowls with wedges of lime, additional peanuts, chopped cilantro, and/or chili flakes, if desired. 12 Repeat steps 5 through 11 for making the second batch of pad Thai. Hello! All photos and content are copyright protected. Please do not use our photos without prior written permission. If you wish to republish this recipe, please rewrite the recipe in your own unique words and link back to How to Make Pad Thai on Simply Recipes. Thank you! I’m Canadian so I checked out your link to Amzaon.com and they don’t ship to Canada. The cheapest price for this brand on Amazon.ca is 31.40 + 6.49 shp’g. :-( And Walmart doesn’t sell it but I already have Walmart’s Seedless Tamarind in the block so I can try this recipe. Thanks for this write up on Pad Thai. Very informative. I am impressed you have a block of tamarind. Some grocery stores do carry the concentrate/paste. It just depends on where you live. I really like it with the tamarind pulp and that’s the first way I made the recipe and how the chef makes it for the restaurant. I’m glad you enjoyed reading. Hope you enjoy the recipe, too! The recipe calls for 1 cup of sugar, is this a miss print? I would really like to make this. Thank you in advance. Hi Tracy, thanks for your question. It isn’t a misprint. I know it looks like a lot but many Asian dishes incorporate sugar to help balance the flavors. Can’t wait to try this! Looks great Carrie! The picture of this recipe looks so good it makes me want to eat my phone! I am a sucker for Pad Thai and couldn’t wait to try this after seeing the mouth watering photos – so good! I think if you can source tamarind concentrate/paste, palm sugar shouldn’t be hard to find either; it’s what traditionally used in many Thai recipes. Palm sugar’s sweetness is more complex and mellow, not as sharp as white sugar. I’d start the Pad Thai sauce with palm sugar, fish sauce, and tamarind paste in a small pot over medium low heat until the palm sugar melted and then turn off the heat and taste. If needed, add white sugar (if you prefer your Pad Thai with sharper sweetness) and distilled vinegar (if the tamarind paste you used doesn’t yield much sourness) to adjust the taste. The rice noodles I use at home when making Pad Thai is the dried rice noodles. I’d salt & wash them a couple of times and then soak them in hot water with salt again for 15-30 minutes; I never really time it, but I don’t think it takes hours. Usually, I’d soak the noodles first while prepping the rest of the ingredients and they’d be ready by the time I’m ready to start cooking. The salt is for getting rid of what we called “factory smell” that sometimes comes with some brands of dried noodles. It also helps with gumminess problem later on when cooking, too. If your local grocery happens to stock Nona Lim’s Pad Thai noodles, you’re in luck. They’re fresh noodles and so no need for soaking. Another trick to help with separating the noodles is to go the traditional way of using lard for cooking. As for garnish, I’d avoid cilantro and go with green onion/scallion instead. Traditionally, garlic chives are what accompanied Pad Thai along with bean sprouts. In the northern part of Thailand, you could also find a variety in which they use chopped long beans in place of garlic chive. Nothing’s wrong with cilantro; I just think cilantro taste would crash with Pad Thai overall flavor, but that maybe my personal bias from what I’m used to eating growing up. Thank you for this additional information. It helps me see different ways I can use to make Pad Thai. You’re very welcome :) I’m glad you find my comment useful. You may be confusing the word “simply” for the word ‘simple’. Similar words, but two different meanings. Oh my goodness this is so yummy! Really delicious! And simple once you’ve assembled all the ingredients.